One of the things I see often is that people don’t know what bullet they need for job at hand. What can be even more troubling is that I’ve come across a number of folk that also don’t realize that there are so many different bullets out there tendered in the same caliber and that each and every one has its own purpose. Even more troubling is that many folks don’t realize that just because a bullet has a special purpose, it doesn’t keep it from being used for more than one thing. Confused yet? Well I hope not but don’t feel bad if you are: it’s really easy to go nutty trying to decipher the types of out there. When you look at the anatomy of the projectile though, bullets are really as simple as they can get and whether it’s a jacketed hollowpoint or lead target ammo, all you really need to have are three obscure terms in your back pocket to make sense of any bullet and have a good idea about what it can be used for. Bullet, which comes from the French word boulette meaning “little ball” has been with us now for a few hundred years so, first off, let’s look at the parts of a bullet that you sometimes see in print and bear names that can cause some serious head scratching. One is the term meplat. 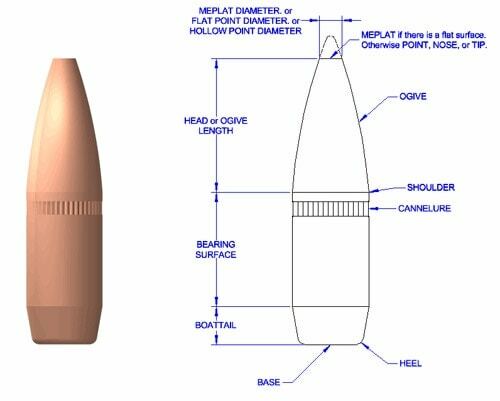 The meplat is the tip of the bullet and its shape and design does a great many things. 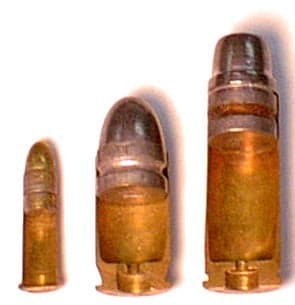 In a semi-wadcutter round the wider the meplat the better the performance on game animals, which is why the best handgun hunting rounds are nearly as wide as the brass casing they are coming out of. When it comes to rifles, the bullet most often seen is the spitzer, which comes from the German word Spitzgeschoss that literally means pointy bullet. 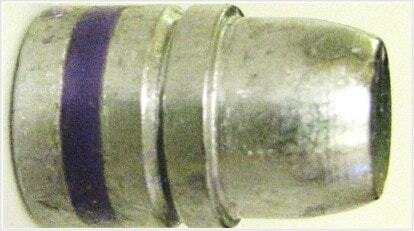 The first spitzer bullet was introduced in 1898 for the French 8mm Lebel and the trend took off from there. At the time, every rifle round was (and today is) loaded with one of these types of bullets, though for years, any cartridge one planned to put in a tube magazine was “off limits” for nearly obvious reasons (picture the point of a bullet placed up against antiquated primers). The French deserve the credit for coming up with a unique primer that kept any chance of detonations from occuring. When it comes to bullets, one of the terms tossed around like candy in a July 4th parade is ballistic coefficient. The ballistic coeffiecient of a bullet is its ability to overcome air resistance in flight. Advertisers of course put their own ballistic coefficient number to help with sales, but this is not the same. The true figure is the sectional density (mass of bullet in pounds or kilograms) divided by its caliber squared in inches or meters. The higher the ballistic coefficient the flatter the bullet will shoot in the long run, a quality much more desirable when you are using the bullet for hunting. So why are these terms helpful? All of these can help the shooter pick out the right bullet for the job they want to get done. If you pick a handgun bullet with a small meplat than you might only wound the deer you are trying to kill. You might find a bullet with a low ballistic coefficient and try to take a long shot on a deer or an elk and wound it or miss it altogether. The terms are important but you need to put them in practice, but that’s fun part isn’t it? Any chance to get to the range is a good thing, and choosing the right bullet for the job can do nothing but make you a better shooter.